Soon to be launched by Ambica in the Philippine market and shall be exclusively distributed by D and G Pharma, is the Nozovent Anti-Snoring Spray. Nozovent Anti-Snoring Spray is a new complement to the Nozovent method (Nozovent Classic and Nozovent Nasal Strip), which aims to promote unobstructed breathing when people sleep or take part in sports. In normal circumstances, it should be easy for the air we inhale to pass through the nose and into the lungs, regardless of whether we are sleeping, sitting or walking. Sometimes the airways become constricted and the people then have to make an effort to get air into their lungs or else they start breathing through their mouth. In both cases, there is a risk that they will start snoring. The noise of snoring during the sleep is produced when the muscles in the pharynx relax and the soft palate and tongue fall backwards. The airway is then constricted. When it becomes more difficult to get air into the lungs, more energy is needed, the air travels at a higher speed and the palate starts to vibrate (in the same way as a storm shakes the boughs of a tree). The noise of snoring is produced by the vibrations in the palate and pharynx. Nozovent Anti-Snoring Spray is designed to be used by people who suffer from snoring. When the upper airways are partially constricted, a disruptive noise, snoring, is produced when people inhale during sleep. Between 20% and 30% of the population snore. This figure is considerably higher among men after the age of 50. The noise level can correspond to the start of a large motorcycle, around 80 decibles. Snoring can also occur in combination with breathing stoppages (apnea), which can reduce oxygen saturation and increase the level of carbon dioxide in the blood. Nonetheless, individuals who suffer from severe snoring in combination with breathing stoppages should consult a doctor. Less severe forms can be treated with Nozovent Anti-Snoring Spray alone or in combination with Nozovent Classic / Nozovent Nasal Strip. 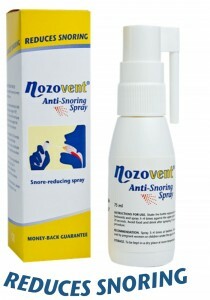 Nozovent Anti-Snoring Spray helps to dampen snoring. It moisturizes the tissue at the back of the palate and the upper part of the pharynx. When the moisture in the mucosa increases, the elasticity of the tissue is improved. The vibrations are therefore reduces, together with the noise of snoring, and sleep is enhanced and undisturbed. Nozovent Anti-Snoring Spray is made up of a combination of three natural vegetable oils, olive oil, sunflower oil and peppermint oil, the last of which gives it a refreshing flavor. It also contains vitamin E and vitamin B6. Vitamin E provides protection from free radicals, which interact with the cells in the body and inflammatory substances such as prostaglandins and leukotrienes. The daily vitamin E requirement is 12 mg and Nozovent Anti-Snoring Spray provides about half the normal dose. Vitamin B6 is needed to form connective tissues, repair damaged cells and reduce the fluid content in the tissues. A normal dose of Nozovent Anti-Snoring Spray provides about 1 mg of vitamin B6 which provides a local effect. The daily vitamin B6 requirement is 3 mg, most of which are obtained from food (fish, meat and some vegetables). It is high time that people should be able to address snoring as a serious health issue. In July 2008, a study reported by the Daily Express in the United States, has found that “heavy snorers are six times more likely to suffer a heart attack while asleep”. It states that “the risk of heart disease could be increased by blood pressure, and nerve and hormonal changes caused by snoring, and that people sho suffer from obstructive sleep apnea are mostly at risk. The newspaper quoted the British Snoring and Sleep Association which said that anyone who snores should get treated immediately.